Mercury Marine has put its own spin on hybrid boating. Mercury took a different approach with its Hybrid Concept Vessel: load it with the latest technology, take it to the Miami International Boat Show and see if there&apos;s enough interest for a production model. 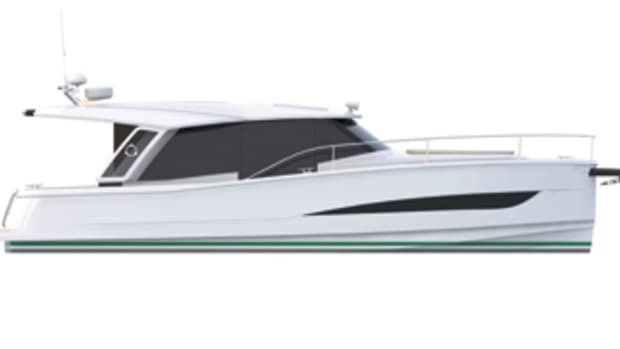 Click play for a virtual sea-trial of Mercury&apos;s Hybrid Concept Vessel. Mobile users, click here to watch on YouTube. The Mercury Concept Vessel is a 42-foot Maxum express cruiser equipped with diesel/electric power in a Zeus pod-drive configuration. A 60-kW lithium-ion battery powers two 100-hp electric motors mounted between the 550-hp Cummins MerCruiser diesels. 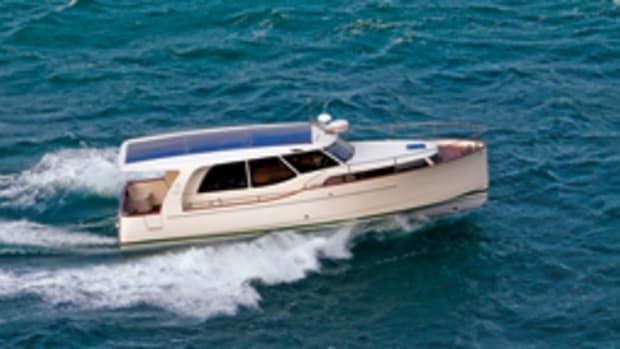 Under electric power, the boat can cruise up to 10 mph. Under the joystick control of the Zeus system, you can glide along hearing only the sound of water hitting the hull. Electric power is also used with Zeus&apos; Skyhook function, which holds the boat in a designated position using GPS. 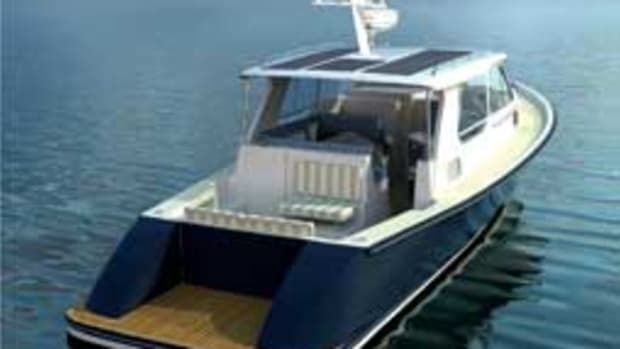 The boat is also equipped with solar panels under retractable sunpads on the foredeck and on the hardtop. They feed the battery under the cabin sole. 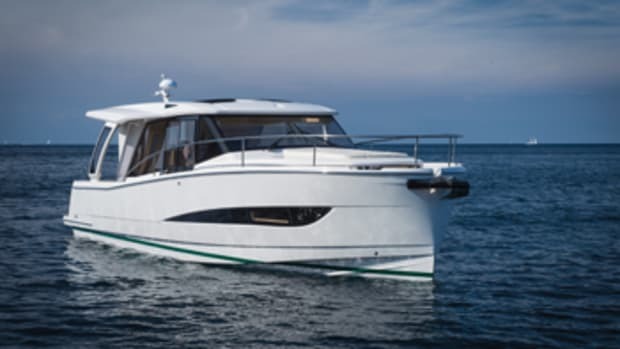 The battery is charged in three ways - the diesels, solar panels or shore power. To learn more about the boat, Soundings caught up with Dan Balogh, Mercury chief program engineer for hybrid and electrical systems, at the show. Q: The operator can choose diesel or electric power, and there&apos;s a mode whereby the system handles that transition. How does that work? A: It&apos;s called Hybrid Mode. It is basically an automatic mode. It gives the computer the right to turn on and off the diesel, depending on where the throttles are and how much battery charge you have. Q: How does the computer know when to switch to diesel? A: It looks at how much throttle you are asking for - your demand on the throttles. If your throttle position is near where they would be for top speed, it would be running on diesel power. Q: And is there an rpm setting where the diesel kicks in? A: The concept boat is now calibrated to around 1,000 rpm. So 1,000 rpm and above it&apos;s diesel, and below 1,000 rpm it&apos;s electric. And 1,000 rpm on electric is roughly 10 mph. Q: Could you calibrate to a higher rpm? A: In our boat it really wouldn&apos;t make much sense because at that point the boat is pretty much mushing. The nose is up; it&apos;s plowing a lot of water. It&apos;s really a poor use of battery [power]. I guess technically it could go faster if you wanted, but it really makes no sense. Around 8 mph is good, between 8 and 10 it starts to get iffy, and above 10 it&apos;s definitely not a good place to run the electric motors. Q: How do you know the system is saving more energy than it is consuming during the operation? A: One of the big benefits is that we&apos;ve removed the generator on our concept boat. The batteries supply all the power needed for air conditioning and lights, stereo, entertainment center, refrigerator, etc. If you spend a lot of time running near top speed, you&apos;re probably not going to save much with our system, because the system is really designed to complement the low-speed operation. But if you think about it, there are a lot of no-wake zones and time spent waiting for bridge openings and other factors that require you to go at very low speeds. And now you can do it without any emissions and without burning any fuel. Q: Could this system be linked to non-Zeus propulsion? A: Absolutely. A lot of our engineering work was done to make this hybrid architecture scalable - smaller boats or bigger boats. It is not locked into Zeus. It could go into sterndrives; it could go into inboards. And not just one type of sterndrive. It could go with Bravos and Alphas. It&apos;s really attached to the engine side of the piece, so you would just make adjustments in the engine room and add [electric power]. Q: How many batteries are used? A: The number of batteries isn&apos;t as important as the capacity, so think of it in terms of 60 kilowatt hours. There is a lot of talk about the Chevy Volt [concept car]. The Chevy Volt, I think, has a 15- or 16-kW battery, and it&apos;s an electric car that can drive around for 40 to 80 miles on a single charge. This boat has, roughly speaking, four times that storage. It is significantly bigger than those in the automotive vehicles out there right now. 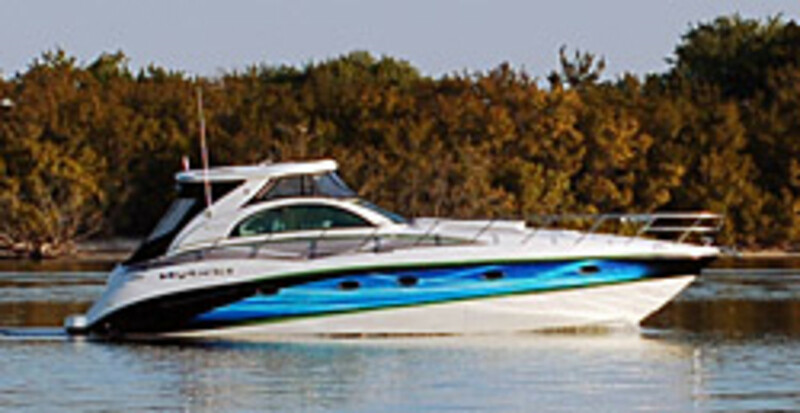 Q: Are you using Mercury&apos;s SmartCraft system? 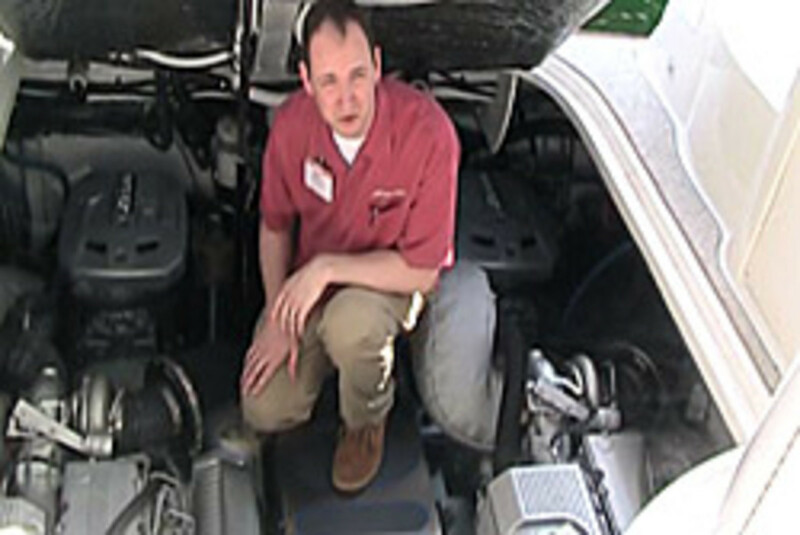 A: The hybrid drive system works off SmartCraft. 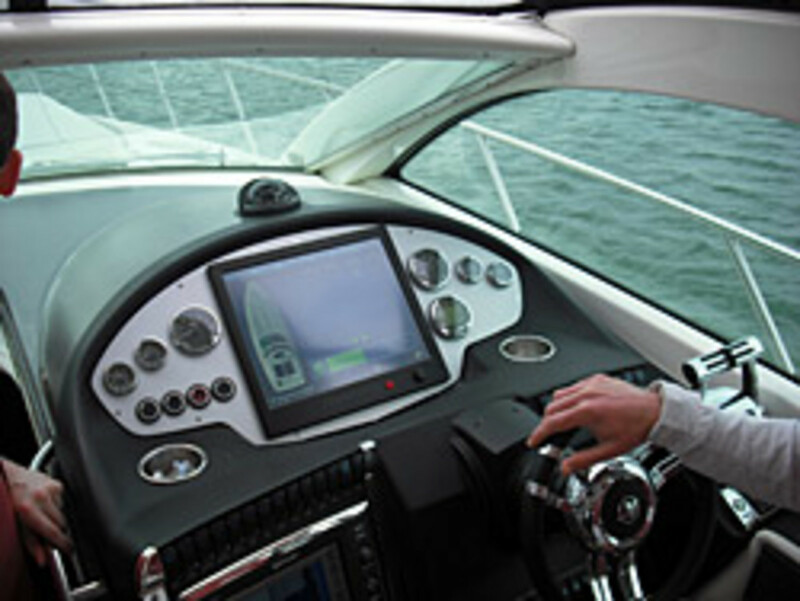 SmartCraft controls Zeus and the diesels, and it also controls the electric motors and the battery systems. There&apos;s the motor and then there&apos;s the battery, and the battery supplies energy to the motors. Between those two steps there&apos;s an intermediate module called power electronics or motor controller. That&apos;s another element of the overall system that we needed to integrate. If you look at the setup, the batteries go to a power electronics/motor controller piece and then you go to the motors, and the motors are linked to the drive train. These are new parts for a lot of people, including me. Q: How did the Hybrid Concept Vessel come about? A: It was a concept boat, strictly meant to be internal. At some point we decided that it was good enough to make further refinements and go through with some cosmetics and then take it to the show. Hybrid propulsion is an up-and-coming trend. It&apos;s pretty much a no-brainer when you look at automotive or industrial vehicles or buses. Many of them are hybrid. If they&apos;re not hybrid now, there are plans to become hybrid. Years ago we recognized the trend and started to dabble and see if it was worthwhile for recreational marine. Q: Will there be a production hybrid from Mercury? A: There are a lot of things that have to fall into place for that to happen, but the feedback has been really good. So I think it&apos;s just a matter of time before it happens. The intention to bring it to the show was to see which features were popular and useful. We packed the boat full of technology - solar panels, telematics system, warning lights, and, of course, hybrid - so there&apos;s a lot of elements to it. We really wanted to show those elements off to see what is valuable and what is worth putting into a production piece. Q: Can you estimate how long it will be until there is a production hybrid boat? A: I&apos;ve told people it feels like about two years away, but there are pieces of the boat that are closer to production than that. Solar pieces could be added to boats today without a lot of integration or development. Read the full interview in an upcoming issue of Soundings and Soundings Trade Only.